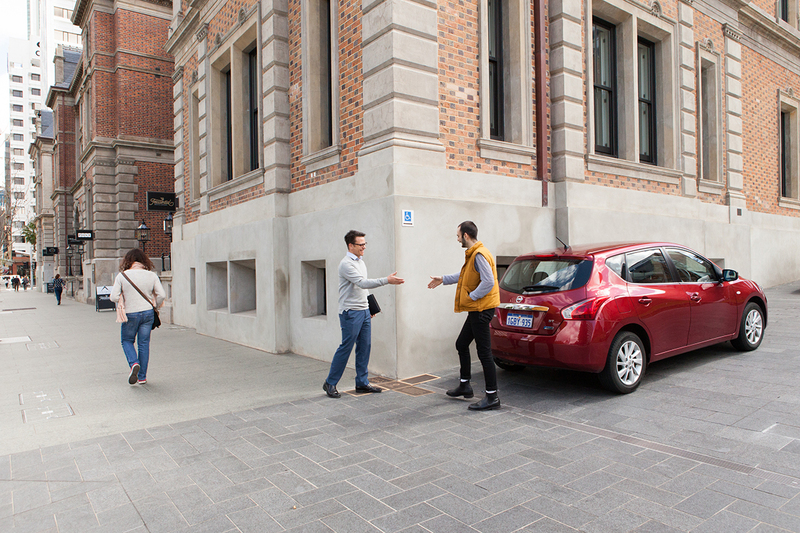 Located in the newly developed complex near St George’s Cathedral, with restored and reinvigorated Treasury Buildings and the architecturally-celebrated new City of Perth Library clustered around Cathedral Square, Proximity Festival 2017 sends participants on a walking tour of discovery. A whirlwind of experiences takes each participant through the festival’s diverse offerings. Jen Jamieson generates oxytocin with her participants in a re-working of Let’s Make Love, first presented at Proximity Festival 2014. In Tresse // Passing — Don’t Touch My Hair, Hannah Brontë weaves together hair, personal and political reflections in a poetic braid. The Trees of St. Georges Square has Mike Bianco making horticultural digs at Australia’s immigration policies. Liam Colgan hides in plain sight while sharing his daily experience of invisibility with Reflex of a Blush, and Nat Randall perseveres with an extended cultivation of celebrity in Exclusive. 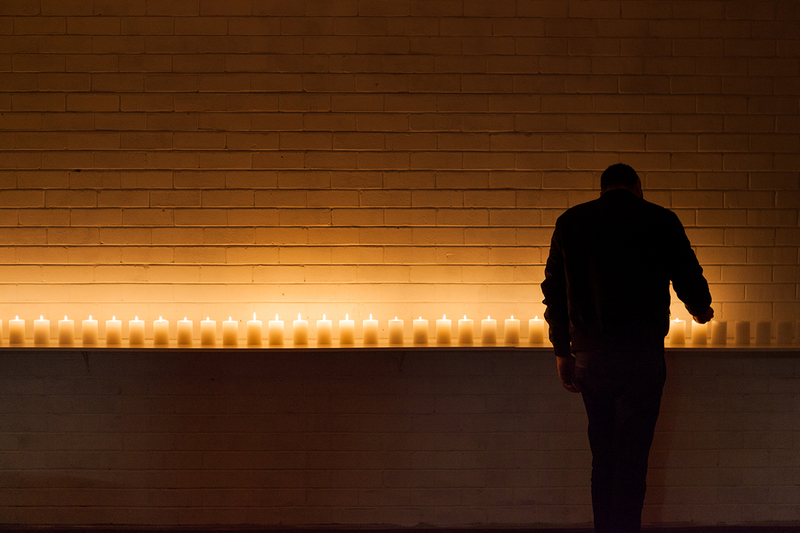 In This Little Light of Mine, Rachael Dease uses silence, darkness and the evocative experience of lighting and extinguishing candles to present the perspective of a lifetime. Following the concise written instructions within a progression of gift boxes, I light a row of 83 candles, in line with statistical data for Australian average life expectancy, before extinguishing one for each complete year that I have lived. The process creates time for silent contemplation in the flickering light. When I’ve exited through blackout curtains into a bright, colourful space, Dease slowly walks toward me while singing; asking what would I choose to do if this were my last day, if this were my final candle? Departing with a candle labelled with my expected remaining years, I am left shaken and thoughtful. Through dance, Tyrone Robinson challenges our self-perceptions and sense of compassion in Consent. A slightly opaque plastic sheet and cumbersome headphones detach me from the world as Robinson, covered in white paint, scampers around with animal motions, including cute and endearing mannerisms. A red lanyard strapped onto his head and face becomes a muzzle as an assistant, concealed in a whole body suit and mask, attaches a carabiner and tether. Restrained, Robinson rears upright, reminiscent of a dancing bear. On my cue, I take a seat in front of him and Robinson, seemingly nervous and unbalanced, holds my attention with his staring dark eyes emphasised by the white paint. Disconcerted, my headset silent, I rise and detach the tether. Returning to all fours, Robinson scampers until again restrained by the assistant. Trembling, he faces me, as recorded instructions direct me to the table next to my chair. By marking the creature’s white body with powders and dye provided, I am promised qualities such as “strength,” “grounding” and “wisdom.” Unable to proceed, I listen to instructions to run a coloured line across “its” chest” and rub dye into “its” mouth, while Robinson shivers and watches me. Each moment is confronting, intense and distressing, later reflection further questioning my sense of privilege, ownership and self. Meeting on the street at the corner of Treasury Building, Martyn Coutts in Shell Game engages me in ice-breaking small talk, sharing stories of recent life experiences and our hopes for the future. He skilfully moves the conversation to developments in the South China Sea while we adjourn to the atrium. Coutts produces a deck of cards to scry the fortune of the Spratly Islands. Each card depicts an island, with a satellite photo, its name written in the language of the occupying nation and a simple symbol. Coutts explains the symbolism as we examine the cards, lending context to the shape, vegetation and facilities of each island. My three chosen islands are all claimed by China, each displaying extensive development and fortifications, indicating a Chinese influence in the Spratly Islands’ future. Geopolitics has never been so convivial. The Ride transforms a church hall into a movie set. Industrial fans are arranged in front of a motorcycle which is ‘posed’ for a camera that sits before a screen with an image of the Australian outback. As I don a jacket and sunglasses, Cigdem Aydemir briskly puts on a black hijab, tucking excess cloth into her black leather jacket that co-ordinates with her form-hugging black trousers. An extra, I wait for rescue by the main character. After a brief practice run, we record. With slow graceful movement, Aydemir steps lightly onto her bike. I follow, ungainly in comparison, mounting the pillion seat. She starts the bike and we move along the road, the fans blasting as we accelerate and the scenery rolls past. The calm hero, Aydemir, is in control, as the wind unfurls her hijab and its magnificent length trails us across the desert. She points as we pass something and we turn our gaze before the ride ends and she leaves without a word. The screen replays Aydemir rescuing another extra, the glamorous star creating an iconic image of machine in the vast red landscape framed by the fluttering hijab flying free, a breathtaking rebuttal to white masculinity’s likely attempts to monopolise a heroic narrative like this one. In 2017, Proximity Festival continues to celebrate ideas and innovative communication where intimate collaborations between artist and audience create unique and memorable experiences. Blurring the lines between artistic disciplines, with no fourth wall and focusing on the individual in each moment, Proximity Festival challenges boundaries, creating art that defies neat categorisation while expanding personal horizons. In moving from an annual to a biennial performance schedule, Proximity Festival has been able to grant nine artists longer sessions and greater resources for each work than in previous festivals, which each comprised 12 performances. For 2017, curators Sarah Rowbottam and Kelli McCluskey invited artists with unique ideas, fresh perspectives and the courage and enthusiasm to push the comfort zones of their participants. Provocateur Jeff Khan, with Rowbottam and McCluskey, ran a two-week Proximity Lab in December 2016, assisting artists to develop their presentations. 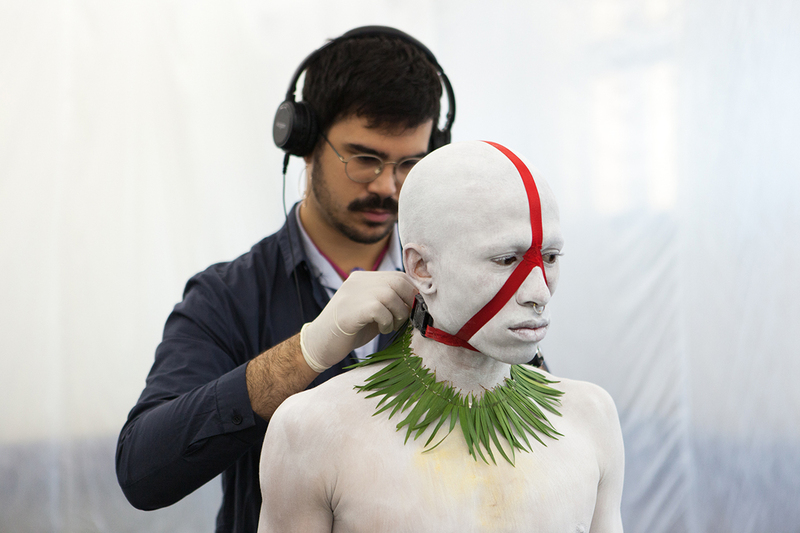 With a longer lead time between the Lab and performances than in previous festivals, artists have been able to develop mature works. 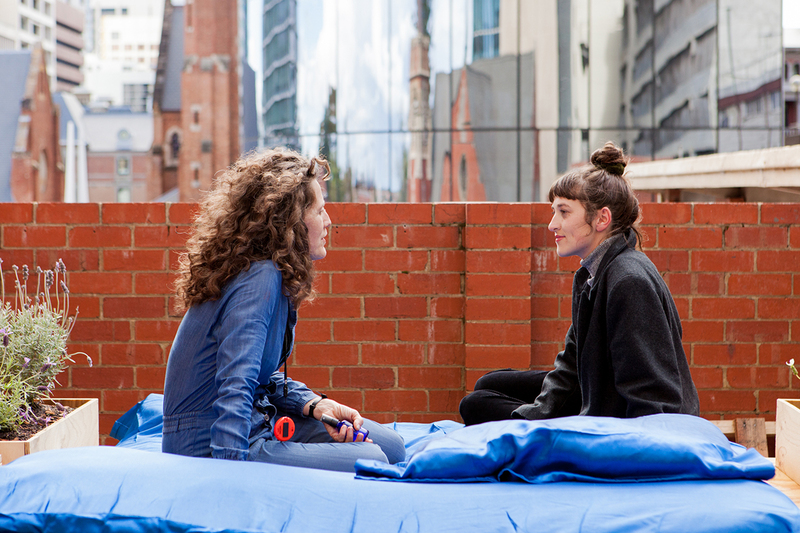 Listen to Claire Nichols’ interviews with Proximity artists here.